Do you purchase products from china? Do you ever be fraud during you payment to suppliers? Do you receive products with too many quality problems? Do you always need to fly to China for inspection before shipping? And still negotiating with supplier after receiving poor quality products? In order to help you guarantee quality, we can provide a series of inspection services along the production process. Initial Production Check (IPC): Inspection of all the machinery, raw materials, materials and components to be used prior to place an order. First Article Inspection (FAI): Full examination of the first samples based on your drawings, planning, purchase order and specification requirements after the mass production starts. During Production Check (DUPRO): Control during the manufacturing phase, detection of defects/deviations and recommendation of corrective actions. Production Monitoring (PM): Constant oversight in your factory with daily reports on quality and production process. Pre-Shipment Inspection (PSI): Guarantee the conformity of your final production to your requirements and international standards in terms of quality, quantity, packaging, marking, etc. 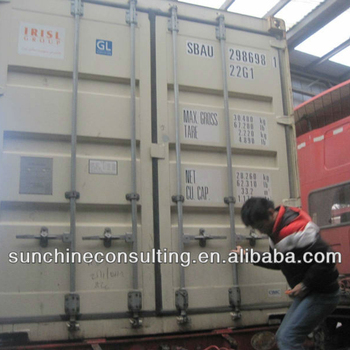 Container Loading Check (CLC): Control of the finished and packed goods (product specifications and quantity), make sure they are securely loaded for shipment. supplier first assessment(SFA):basic investigation/study for legal status,seriousness and solvency of supplier in china by business document and other public information check. factory Audit(FA):assessment of the production facilities and organization according to ISO 9000standards to check production capacity and quality level prior to order. social audit(SA):audit of supplier's level of social resposibility according to SA 8000 standard. chemical, textile & leather ,metal , mechanical & electric ,cosmetic, food,etc. And also with supplier & factory audits so that you can be assured your future chinese business partner is trustable, can produce the goods with high quality according to your specific requirements. Professional in business consulting, quality management and inspection services.we can advise you regarding suppliers' selection, help you to make the factory audit and assessment and provide third party inspection services all along the production process. Chinese/France Management team with an extensive experience in International Trade Consulting and in Quality Management in France and in China. Extensive QC experience and strong detection capability to provide the buyer with the most reliable product quality guarantee. Our inspectors are trained to detect products containing non-standard or non-compliant components. We respect the fact to be impartial, fair and honest. 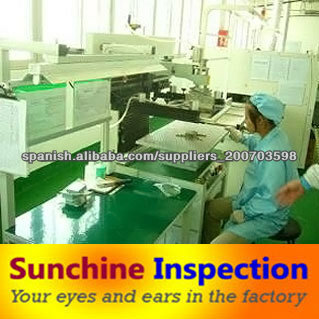 Inspection independent from the manufacturer. 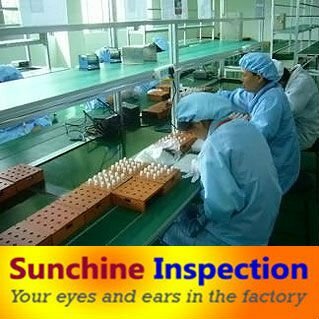 Sunchine Inspection guarantees independence, fairness and trustworthiness for whole inspection procedure. We are responsible for our clients only. Our inspectors are our full time employees and all all have a relevant expertise in the sector of products they inspect ,well-qualified and expert in the field of products they inspect and test. Let us be your eyes and ears in factory!